If you’re visiting Scotland, make sure you make the trip from Edinburgh to the Isle of Skye! Here’s a 3-day itinerary to help guide you along your journey! I’ve never really been one for peak season travel. I don’t enjoy crowds and have never felt like I’ve missed out on the beauty of a destination because I didn’t go at the optimal time. In fact, it’s quite the opposite! Europe in the fall and winter are really quite lovely, sure the lavender fields of France are long gone and the beaches along the Amalfi are pretty vacant, but the UK is just as charming in the cooler months as it is in the shade of summer. In the fall, you’ll find the remnants of summer’s green grass mixed with the gorgeous foliage. And in the winter, nothing is quite as charming as snow falling on castles ruins. Having been to Scotland before and road-tripped around the country, I knew the stress of driving in the Highlands wasn’t something I wanted to deal with this time around. So we decided to team up with Rabbie’s for a tour from Edinburgh to the Isle of Skye and back. Now, I’ve never been a huge fan of tours, but I think there are good tours and there are bad tours and there are times when a tour just makes the most sense. And let me tell you, Rabbie’s was awesome and the tour was much different than any other I had ever been on! What Makes Rabbie’s Tours Different? Small groups! That’s right, no massive buses here. I think the reason I’ve always been a bit jaded to tours and I think that’s because you’re usually packed into a bus of 60 people or more and it almost never goes well. 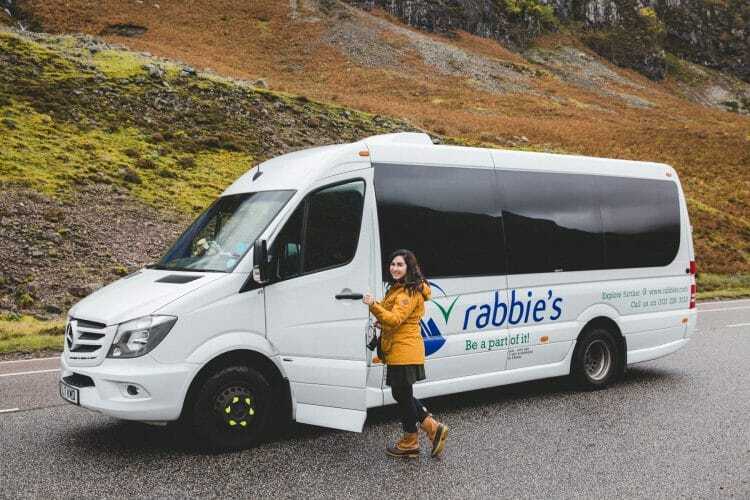 But Rabbie’s operates with small, 16-passenger buses, and this means that if you’re on a multi-day trip with them, you’re likely going to get to know all your companions and maybe even meet some new friends. This might not seem like a big deal until you have to go to the bathroom real bad and you have another 3 hours to go before your next rest stop, I’ve been there, I know. But with Rabbie’s, we stopped at least every 2 hours, which was fantastic! One of the best things about Rabbie’s tours is that there’s no minimum number of travelers. So even if that 16 passenger van isn’t full (ours was), you’re still going on that tour! Unlike pretty much every tour bus I have ever been on, Rabbie’s has a USB charger at every seat! That way you never have to worry about your phone, camera batteries, or whatever else being charged when you want it. If there’s something you really want to see or do along the way that isn’t on your original itinerary, let your guide know and they will do their best to make it happen. Whisky tasting? Shopping? 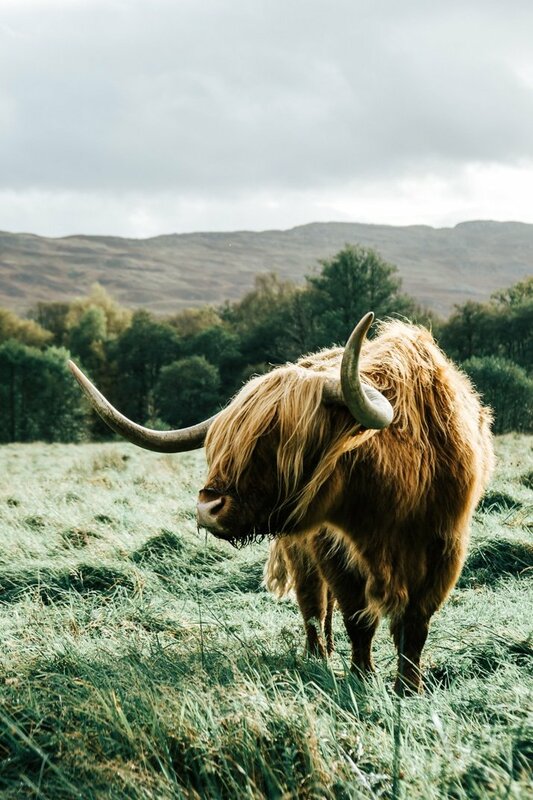 Highlands Coos? Let them know! Or guide made all of these stops for us! Now, I know a lot of tours have entertaining guides filled with knowledge about the area, but what I really loved was that our guide, Stephen, knew everyone’s name by the end of the first day. He engaged with us and made us feel right at home in Scotland. If there was something we really wanted to do, he did his best to make it happen. I also loved how into the tours he got, he had a playlist for our drive and turned on the blue lights from time to time in our little Rabbie’s roller coaster! Save This Map To Guide You On Your Journey! It takes a little over 5 hours to drive from Edinburgh to the Isle of Skye, that is if you’re heading to Portree, the main city on the isle. To get to the northern point would be about 6 hours. The nice thing about this itinerary is that it has built-in stops along the way to break up the travel a bit. On day one, if you’re doing it right, you should leave Edinburgh around 8:00 am and arrive in the Isle of Skye around 5:00 pm. 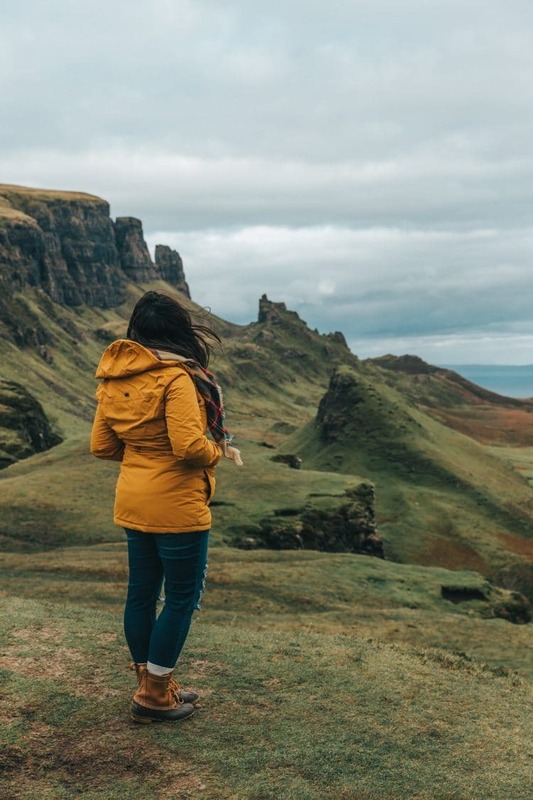 On the second day, you’ll spend the whole day in the Isle of Skye exploring its northern region. I’ve outlined the whole day for you here as well. On day three, you’ll make your way southward again to Edinburgh with some great stops along the way. You should leave around 8:00 am and arrive back in Edinburgh around 7:00 pm. 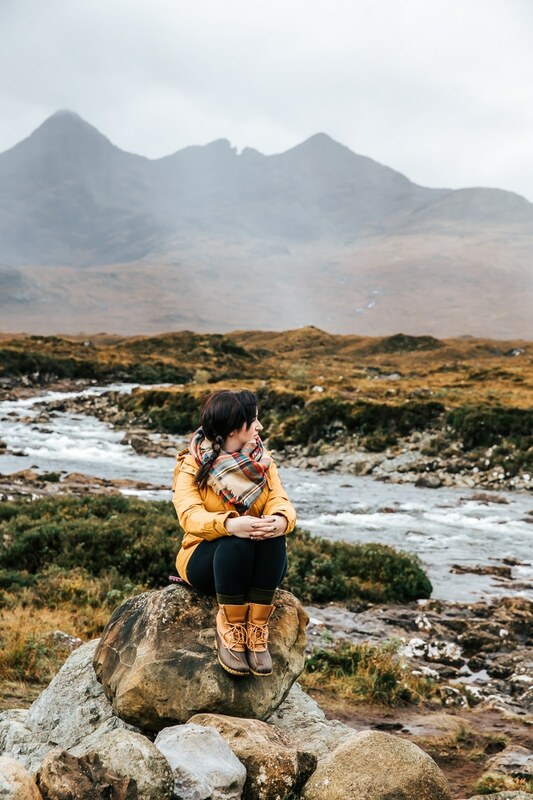 I hope you find this itinerary helpful when planning your trip and I hope you’ll consider booking your tour with Rabbie’s to take a bit of the stress off! Because trust me, Scotland’s breathtaking landscape is truly amazing and it’s hard to take it all in when you’re the one that has to keep your eyes on the road. Edinburgh/ Rabbie’s Cafe Bar – Rabbie’s has their own cafe which also serves as the meeting point for their tours. It’s located on Waterloo Pl, which is a continuation of Princes Street in the heart of the city. I recommend grabbing breakfast and water there before you head off. Just make sure that if you get something hot that you eat it before getting on the bus. Doune Castle – If you’re an Outlander, Game of Thrones, or Monty Python fan this place is kind of a must. On your Rabbie’s tour, you’ll get a view of it from the bridge, but if you happen to be driving, I highly recommend stopping in and touring it. You can read about my visit from when I stayed in Stirling. 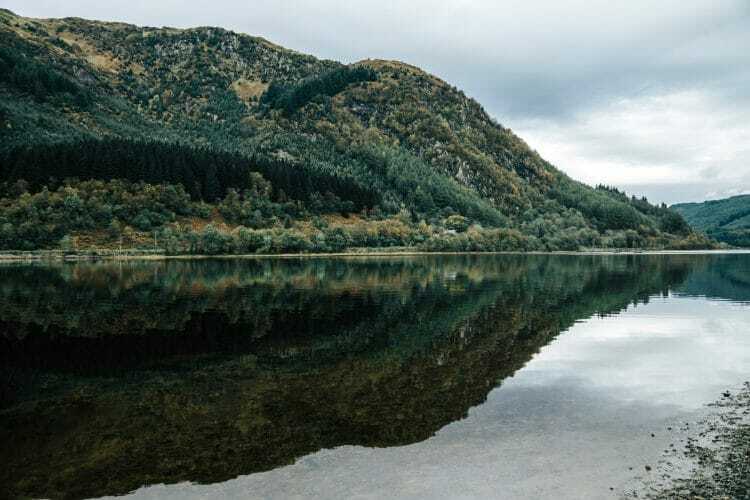 Loch Lubnaig Viewpoint – This is such a beautiful place to stop and take pictures as you begin your journey into the Scottish Highlands. We were there on a calm day and the loch was almost like a mirror. Glencoe – One of the most beautiful areas in Scotland, there’s a great viewpoint that your Rabbie’s bus will stop at. But be warned, a look at this beautiful glen might have you craving more. It’s the home of Ben Nevis, the highest mountain in the British Isles and said to be one of the most beautiful hikes in the world. Fort William – Stop in for some lunch and shopping and to stretch out those legs! 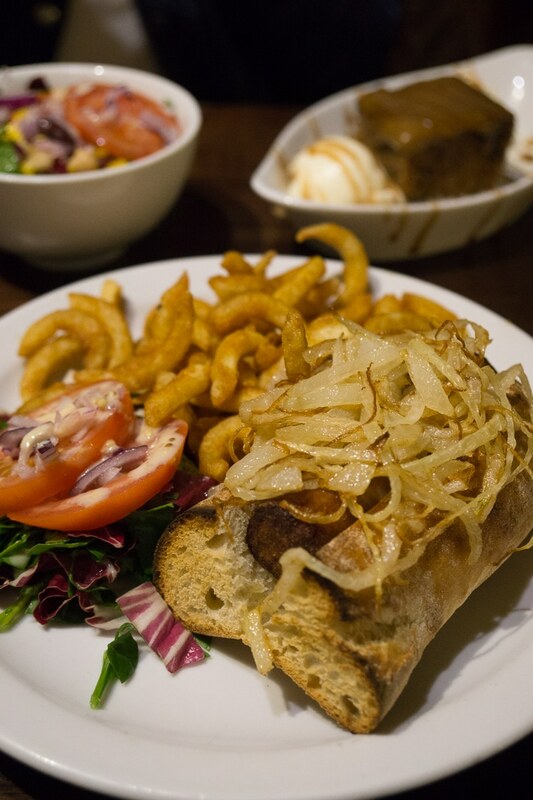 The Grog & Gruel – When in doubt, ask the locals. That’s what we did when it came lunchtime and we had no idea where to go. The guy at the Regatta store recommended The Grog Dog and it did not disappoint, see two photos up). It was a really simple dish, but I’m still craving it a month later! 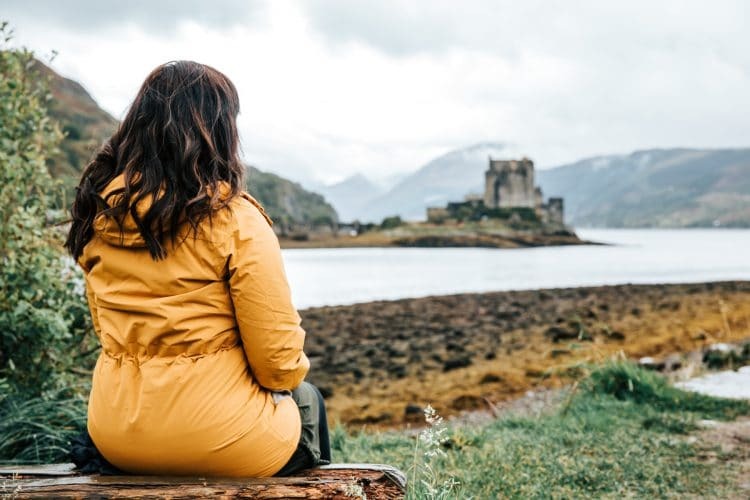 Eilean Donan Castle – Chances are you’ll arrive at the Castle after closes, but that’s okay, we’re going to hit it first thing on Day 3! However, this is a great time to take some photos from a viewpoint right up the road (photo above). Let your Rabbie’s bus show you the way! 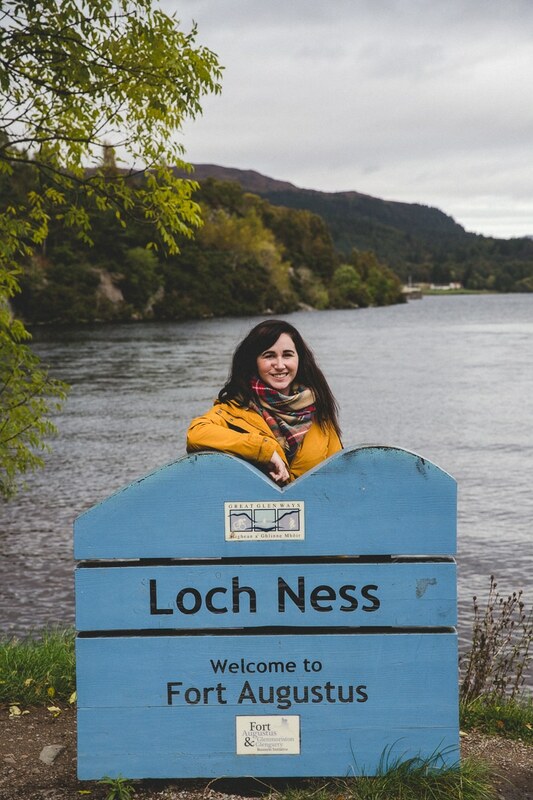 Portree – Hey, you’ve made it to Skye! 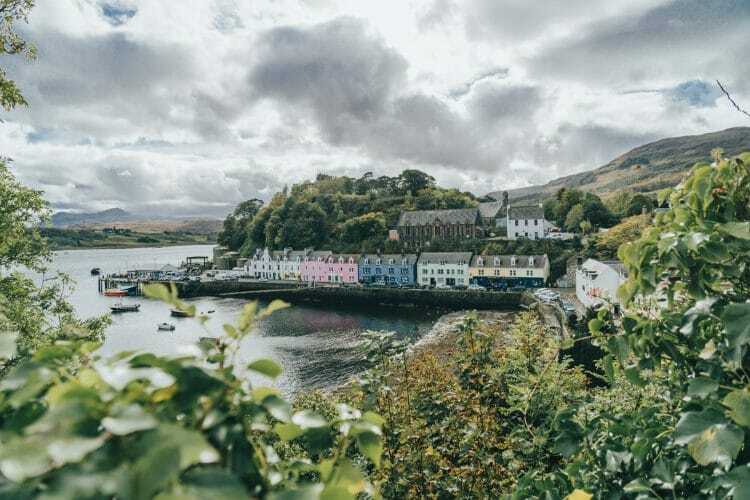 Portree is the bustling little hub of the isle and has tons of shops and restaurants as well as cozy accommodations from hotels to B & B’s to Airbnb! We were hosted by the Tongadale Hotel right in the center of town. The location was great and the accommodations were simple and comfortable. The only thing I will note is that this hotel does not have an elevator and I believe all rooms were on the second floor up. Marmalade – Once you’ve dropped off your bags at your accommodations, it’s time to eat! And Marmalade is an absolute must when in Portree! If you go there without getting the Sticky Toffee Pudding… I might have to hunt you down. Actually, never mind, not getting it would be punishment enough. It’s the best one I’ve ever had. 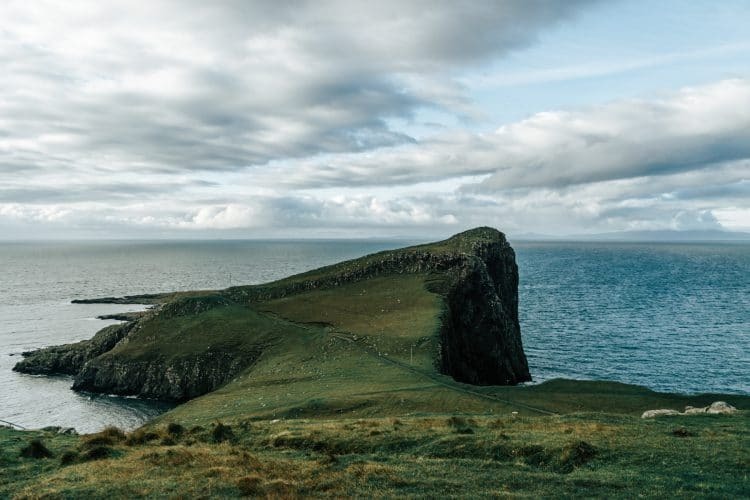 Neist Point Lighthouse – The point sits at the end of a single track road and so you’ll want to make sure you go early since parking is minimal and this is one of the top destinations on the Isle of Skye. It’s an easy walk down with a slight incline back, stay on the gravel and stone path and you shouldn’t have any issues. You’ll love this view of Scotland’s bold cliff faces, even more beautiful than the Cliffs of Moher in my opinion. Dunvegan Castle – Can you see it? That was the game Stephen played with us on our way back from Neist’s Point. Dunvegan Castle can be a little hard to see from a distance since it blends in so well with its surroundings, but if you have the time, it’s a great place to stop and explore. It is still owned and lived in by the Clan MacLeod Chief. The Lower Deck – Head back to Portree for some lunch, I highly recommend walking down the steps to the harbor to The Lower Deck for fish and chips, not the Chippy. You’ll need cash, I think it was about £15.00 for two fish and chips with waters. And watch out for the seagulls, they will literally steal the fish right out of your hands… I am, unfortunately, speaking from experience. Harbor View Point – After you grab a bite to eat, walk up the lane that goes up the hill from the harbor and around the bend to the Harbor View Point where you can get some great photos of the colorful harbor. Be careful though, the sidewalk ends and it’s a busy street. 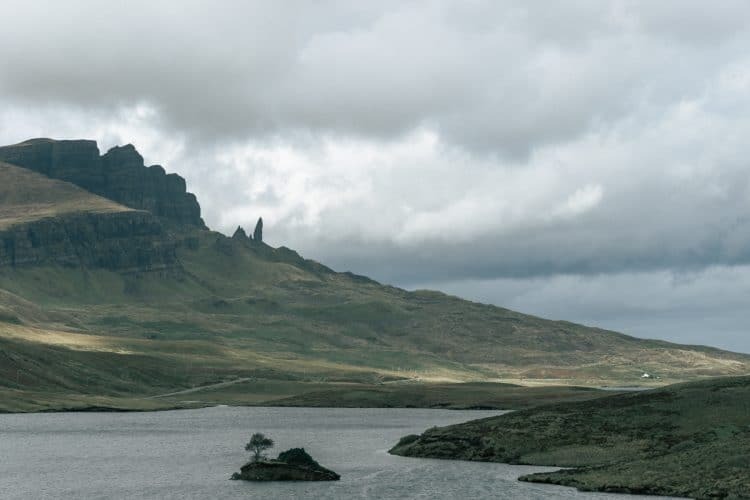 Old Man of Storr – While you can hike to the old man of Storr, it’s a 2.3 mile hike and will take you about an hour and a half to complete. If you don’t have the time or aren’t feeling up to it, you can still get a great view of him from the road. 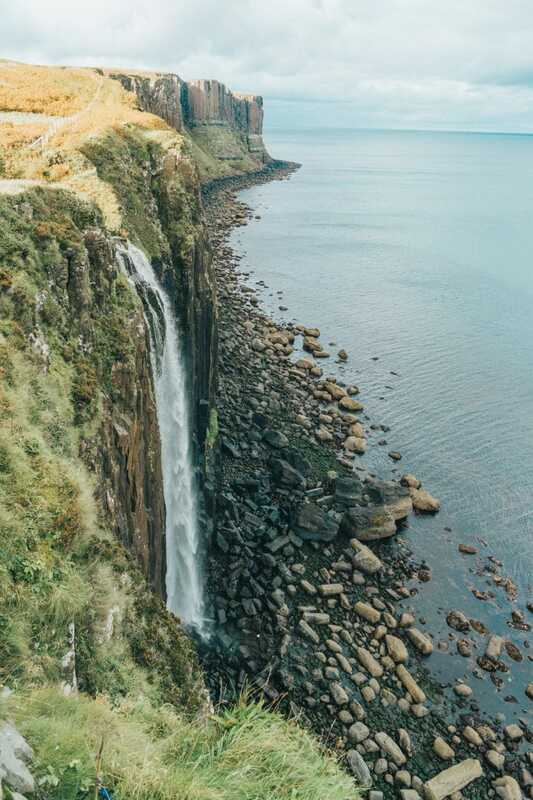 Kilt Rock and Mealt Falls – This sea cliff gets its name from it’s resemblance to a kilt, from the viewpoint, Mealt falls will be quite close and you’ll be able to see the rock formation along the coastline further on. Quiraing – This is probably one of the most awe-inspiring landscape I’ve ever seen. It’s part of the Trotternish Ridge that was formed from a great series of landslips and the Quiraing is the only part of the slip that’s still active, the road up it has to be repaired every year. The Isle of Skye Brewing Company – I’ve never been much of a beer drinker, but I can drink a Scottish pint at room temp. I really enjoyed their Skye Red. Dulse & Brose – Back in Portree, it’s time for another amazing meal! This place is actually the sister restaurant to Marmalade, and every bit as good, except the sticky toffee pudding. If they have the tomato salad on the menu, just order a million of them. Seriously, so good! We got it as an appetizer and had to get another for dessert. MacKenzie’s Bakery – Before hitting the road, you must stop in for some scones and Scottish shortbread, make sure to get jam and butter on the scones! Plus they’re something like 3 for £1, so you should probably buy like 10 and eat them all day long. Sligachan Old Bridge – On your way off the isle, make sure to stop and take in the bridge and the gorgeous Black Cuillin mountains behind it. 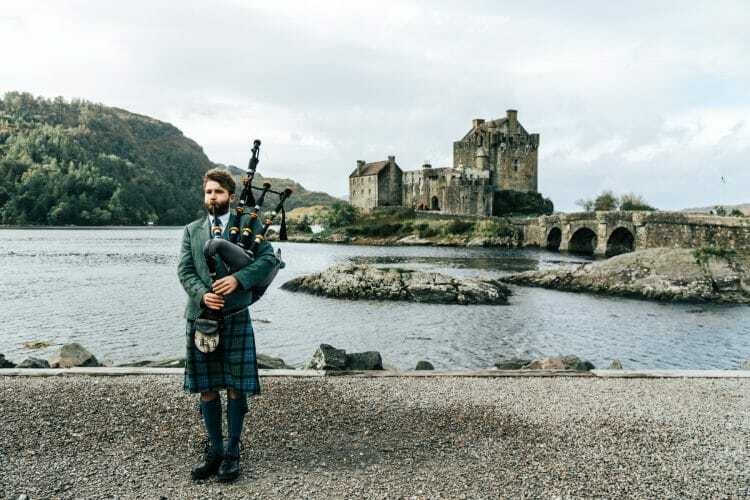 Eilean Donan Castle – It shouldn’t be closed this time around, in fact, you should be one of the first ones in! Take it in from the mainland or purchase a ticket to explore the castle’s island. This is said to be one of the most photographed castles in the world, and I think it’s easy to see why. 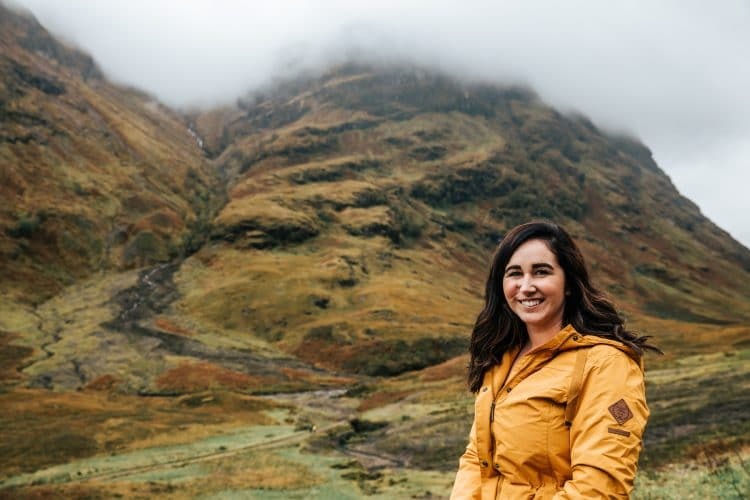 Five Sisters of Kintail – I loved Scotland before I even visited back in 2015, and everything about it has only made me love it more. But it was this mountain range that really got me. On my first trip, we drove through the pass and I was in complete awe. There really is just something about them that makes you feel a little deeper and think a little harder about life. I dunno, I can’t explain it, but there’s just something about them that is so majestic and mysterious. Maybe the legends about them are real. Fort Augustus – Hit your halfway point for a bit to eat and walk around this charming little town. 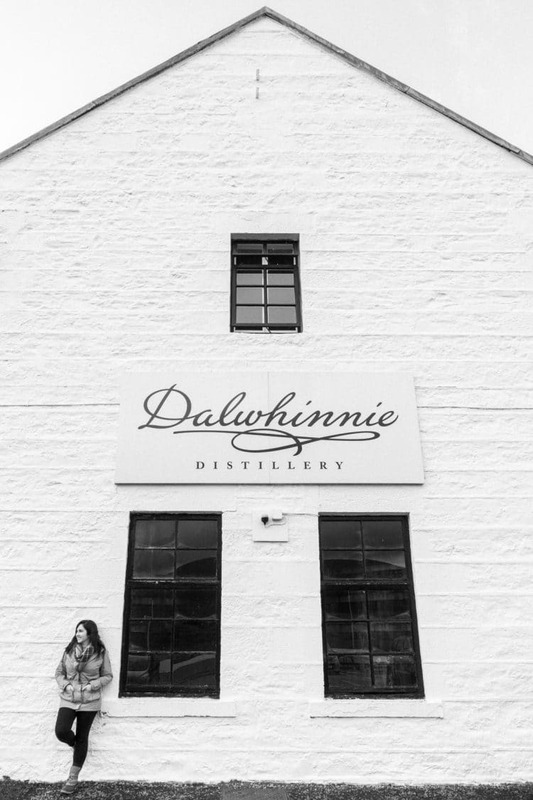 Dalwhinnie Distillery – If you’re a fan of Scotch Whisky, you can’t go to Scotland and not visit a distillery. I did the 3 whisky tasting with chocolate which was £15.00 and I got a whisky glass to take home. If you don’t drink, they’ve got hot chocolate! Forth Bridge – As you make your way back into Edinburgh, stop along the water to take in the three bridges as they light up for the evening! Princes Street Suites – So, this was completely by accident, but I’m telling you about it because it was just too perfect. We booked this place the night before we left on our tour, not really paying attention to where it was. But guess where it was! On Waterloo, right where the Rabbie’s buses depart and arrive. We literally walked off the bus and into our hotel, it was awesome! Plus the hotel was awesome and HUGE! So while I would recommend Princes Street Suites anyway, if you’re taking a Rabbie’s tour it just makes sense to book your stay here. Boots: This time around I brought my Bean Boots, but last time I took my Ahnu hiking boots and they were great! It’s important to have great footwear when visiting the Isle of Skye, even better if it’s waterproof! Jacket: You will definitely want a nice thick jacket, preferably one that’s good with rain and wind. I wore one similar to this one. Camera: You want to capture the beauty of Scotland don’t you? I shoot with a Sony a6000 and love it! Hat: It can get pretty windy in Scotland, so bring a hat just in case! Scarves: Again, another must-have for blocking out the wind! Buy my scarf here! Wow, so there you have it, a grand 3-day adventure from Edinburgh to the Isle of Skye with all kinds of amazing stops along the way! Are you ready to book your own tour now? What’s stopping you, Scotland awaits! Rabbie’s 3-Day Isle of Skye TourBook Now! Exploring Scotland in the offseason has some truly amazing rewards! You don’t have to fight the crowds, you’ll generally have an easier time making last-minute reservations at great restaurants and accommodations, and you’re still likely to get amazing weather! We were there in mid-October and our guide said it was one of the two best days he’d seen in Skye all year on his many trips. Heading to the UK but not to Edinburgh? Rabbie’s tours depart from Glasgow, Inverness, London and even Dublin! Thier Lake District tour in England looks amazing and next time I think I might do their Outer Hebrides tour. They also offer an Edinburgh City Tour! What an incredible journey. I haven’t been to Scotland in many years and it was fun to see all of your beautiful pictures! I think it’s time you make the trip back! And thank you! Wow! Scotland is on my list, as is Ireland, and England, and many many other places… But I love your advice about travelling in the off season. My husband is not fond a crowds, so this would be perfect for us! Mine isn’t either, Trang! My husband and I went in May last time, also considered off-season, and both times has been great! You’ll have to start planning a big trip of the Isles, they are all great countries! Did the tour provide a place to stay .. ? Hi Paloma, the tour does not provide a place to stay but they can help you arrange your accommodations.